This blog entry is dedicated to my sweet little hamster Peaches. I know what you’re thinking – a grown woman dedicating a blog post to a hamster – how ridiculous. A while back, I would have thought the same thing too. Now, a few days after she’s left, I’m finding I’m missing her more than I thought I ever could, so here’s a bit about my little hammy. Last year after coming back from vacation, I was getting pet supplies at PetSmart when these cute little baby hamsters caught my eye. Always a sucker for cute little animals, I asked the salesperson about them. She happened to bring up that she had a previously injured older hamster whose leg had since healed after being broken and was looking for a good home. 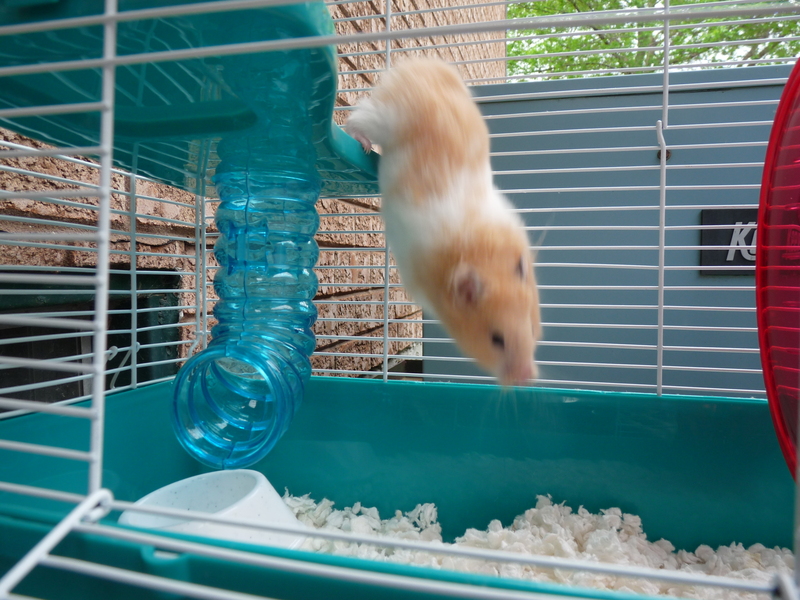 Apparently, she loved to climb the walls of the PetSmart hamster enclosures and broke her leg after a fall. The vet had seen her and her broken leg had healed nicely and they were rehoming her free of cost. 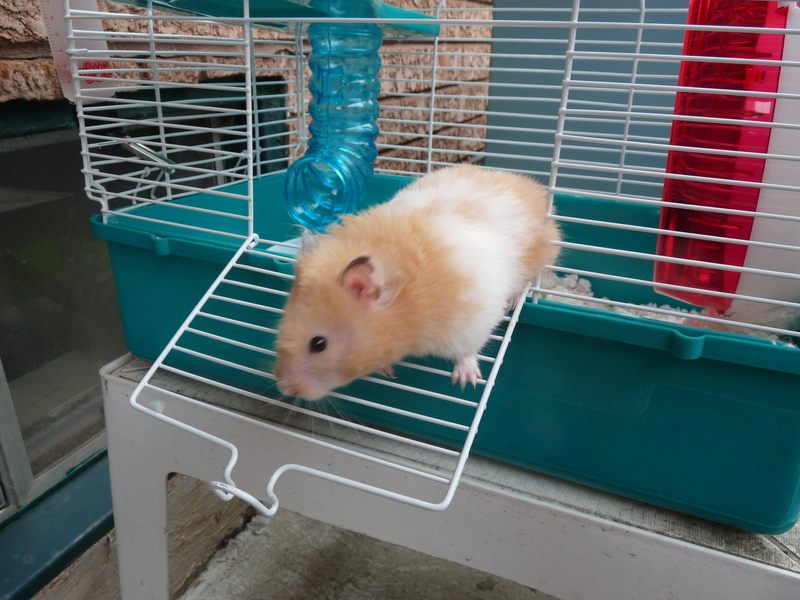 The salesgirl brought her out and I knew I had to take that cute little hamster home. She was five months at the time. My dogs were cool around her, as with all my other animals. Since I sometimes let my dogs have a couple of hamster Extrusion pellets every now and then when I’m feeding the hamsters, they knew the smell and loved it. Peachie would sleep beside her “stashed” pellets. It was hilarious to watch Bruce lick his lips every time she was out of her cage and he had a chance to sniff her. I put her in a little temporary cage that night and wrapped her up in a lot of towels to keep her warm. The next morning, I checked on her expecting to see her dead; she hadn’t moved a bit since the night prior. The only sign that she was alive were her little pink feet. I waited for quite a while watching her, but I didn’t even see her breathing. I picked her up and I finally saw her take a breath. I held her for a few minutes and she opened her eyes all the way. I got happy thinking maybe she was coming around and would get better. I wanted to keep her warm in my hand but I had to get ready for work, so I did both at the same time. Encouraged by the fact that her eyes were fully open, I tried to give her some water from the dropper again. She choked on it 😦 I had given it to her the same way the night prior being careful to hold her at an angle so she could swallow, but it seemed she was shutting down and just couldn’t swallow it anymore. I finally put her back into her little bed lined with towels from the night before. I left her for literally sixty seconds, and I came back to find her dying :’-( She had foam coming out of her nose and she was contorting her little body in a very unusual way. She exhaled – it was literally like her little life was leaving her. After that, she looked so flat, like a deflated beach ball. I stayed there for quite a while afterward to ensure she was really gone – I had thought she had died a few times over the past few hours – it had been hard to tell the difference and I didn’t want to leave her if she was still alive. But she was really gone that time. I feel so badly that she suffered the last few hours. I still can’t believe I got so attached to such a small little thing. Good-bye Peachie. You were such a cutie pie. I’ll miss you.